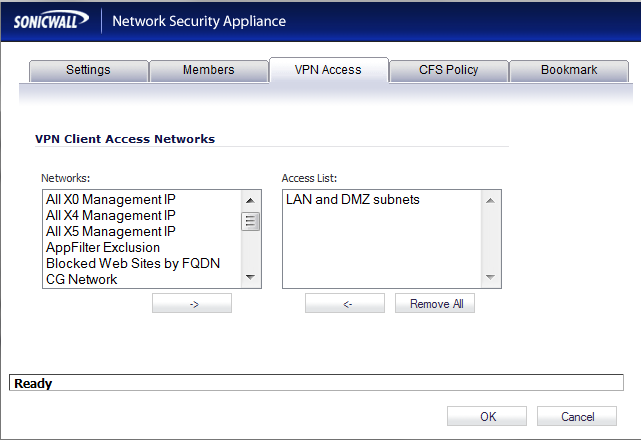 For a while now I’ve had my Sonicwall Global VPN policy on the firewall set as a “route all” connection. This means that all traffic for the VPN client goes through the Sonicwall directly, and blocks access on the client’s end to local devices. Yesterday I came upon a situation where I needed to enable a client access to both the VPN and local devices at the same time. This called for Split Tunnels! However, I didn’t want to enable split tunnels universally for all my VPN clients. Luckily I found this Sonicwall documentation on setting up a single WanGroupVPN with two different policies based on user group. The premise is that you set up your Wan GroupVPN as a split tunnel, but then give certain users access only to a specific address object and use a specific NAT Policy (I won’t regurgitate the entire document here). This was working great, but I shortly found that when testing as the split tunnel user, I would get connected and then disconnected within 10 seconds. Typically the connection would last for 3 successful pings. After a bit of Googling I found this article which explained it being caused by an incorrect address object within the “VPN Access” tab for the user. I looked at both the “Everyone” and “Trusted Users” group and it looked the same. Somehow that was still selected for the “Everyone” group, but it just wasn’t displaying when viewing the “VPN Access” tab. So I clicked “remove all”, and then re-added the appropriate objects, and problem solved! Does your vendor treat you well?